In honor of the Feast of Our Lady of Guadalupe, [December 12th] here are seven amazing facts about the image of Our Lady as seen on Saint Juan Diego‘s tilma that defy scientific explanation and argue in favor of its miraculous origin and divine provenance. The image of Our Lady of Guadalupe first appeared on December 12th, 1531. According to the account, the Virgin Mary told Juan Diego, an Indian convert, to tell Bishop Juan de Zumárraga to build a chapel to her Son. Bishop Zumárraga asked Diego for a sign as proof that it was truly the Mother of God. Our Lady instructed Diego to gather some roses in his tilma [popular piety attests that Mary arranged the roses in the tilma herself] and present them to the bishop. As Diego did this, the roses fell to the floor, revealing the miraculous image. Infrared photography has demonstrated that there is no sketching on the image whatsoever. Dr. Philip Callahan, a research biophysicist from the University of Florida explains: “It is inconceivable that an artist in the 16th Century would paint a portrait without first doing a drawing on it.” Making an under-sketch prior to painting a portrait goes back to antiquity. The existence of such an exquisite depiction on textile made from cactus fiber is inexplicable given the lack of sketching. Juan Diego’s tilma is made of a rough cactus fiber which normally disintegrates in 15 to 30 years. Yet, the image of Guadalupe has remained intact for 484 years without fading or cracking. Moreover, it was subjected to candle smoke for many years, which should have accelerated the process of deterioration. In 1778, a worker accidentally spilled strong nitric acid onto a large portion of the image. To everyone’s astonishment, only slight stains appeared which can still be seen in the upper right side. Additionally, in 1921 a bomb concealed in some flowers was placed on the altar directly under the image. When the bomb detonated, the marble altar rail and windows 150 feet away were shattered, a brass crucifix was twisted out of shape, but the image was left unharmed. 3. The stars that appear on the image are astrologically correct. Also, the constellation Virgo, representing virginal purity, appears over the area of Mary’s heart signifying her immaculate and virginal purity, and the constellation Leo the lion is over her womb. The lion represents Jesus Christ, because Christ is the lion of the tribe of Judah. This emphasizes that Christ the King is present in Mary’s womb. The perfect placement of stars in their various constellations illustrates the infinite intelligence behind the miraculous image of Mary. 4. Mary’s eyes are astonishingly life like. 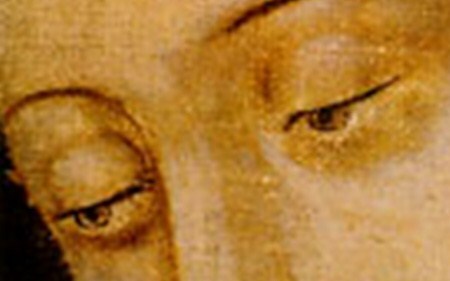 Jose Aste Tonsmann, a Peruvian ophthalmologist, examined Mary’s eyes at 2,500 times magnification. He was able to identify thirteen individuals in both eyes at different proportions, just as a human eye would reflect an image. It appeared to be the very moment Juan Diego unfurled the tilma before Bishop Zumárraga. 5. Mary assumes a different ethnicity depending on one’s vantage point. It is remarkable that at one distance Our Lady appears to be a Native American, but at another distance she appears of European descent. This miraculous feature is meant to show the unity of the two peoples and the two cultures in light of the true faith of Christ. 6. The image’s temperature is always 98.6°F; the temperature of the human body. What is more, Carlos Fernandez del Castillo, a Mexican gynecologist, after carefully examining the tilma and the image of the pregnant Madonna concluded that the dimensions of Mary’s body were that of an expectant mother at the end of gestation. For more about the miraculous aspects of the image of our Lady of Guadalupe see this video, a transcript of which is available here. If we do not believe in miracles, we do not ask for them. If we do not ask for them, they will not be granted. We are not alone: the Church Militant and the Church Triumphant are closely knit, interwoven in charity. We on earth must intercede for each other and believe and ask for the intercession of the saints. Today is the Feast of St. Juan Diego, of Our Lady of Guadalupe fame. Mexican, native-American St. Juan Diego Cuauhtlatoatzin (+1548), was granted an apparition by Our Lady Virgin Mary four times on the hill of Tepeyac. He had been declared Venerable in 1987. St. John Paul II decided to beatify him without the approved miracle. He was beatified on 6 May 1990. Under normal circumstances, for a beatification there must be a miracle which has been rigorously studied and approved by the Congregation for Causes and Saints accepted by the Holy Father. St. John Paul bypassed the process. Pope Benedict and Pope Francis have done the same occasionally… well… Francis pretty often, as it turns out. There was a miracle for Juan Diego’s canonization, however. It is quite a story. On 3 May 1990 – note the date – Juan Jose, after getting drunk and high on marijuana with a friend, went home and started to cut himself on the head with a knife. His mother, Esperanza, tried to get the knife away but failed. She implored him to stop abusing himself and give up the alcohol and marijuana. He shouted that he didn’t want to live any more so loudly that the neighbors came to see what was going on, but the door was locked. Juan Jose threw himself off the balcony of their second floor apartment (in the USA this would be counted as the third floor). Juan Jose fell about 10 meters and landed close to a friend of his, Jesus Alfredo Velasquez Ramirez, who saw him land on his head on the concrete pavement. Juan Jose was bleeding copiously from the mouth, nose and ears. They covered him, thinking he was dead. He suddenly sat up, rose and went to the stairs leading to his apartment. On meeting his mother coming down the stairs he asked his mother’s forgiveness. They embraced and remained that way for another ten minutes or so before the ambulance came. During the ambulance ride Juan Jose said he had lost his vision. He was able to say a Our Father. He was registered at Sanatorio Durango at 1830. The medical prognosis was very pessimistic. The doctor, Juan Homero Hernandez Illescas, later explained that it was already incomprehensible that he was still alive. They did tests immediately and found that Juan Jose had a fracture of the epistropheus, a large hemotoma in the right temporal-parietal region extending to the lateral part of the neck and lacerations of the muscles about the parapharyngeal space, fractures from the right orbital to the clivus, intracranial hemorrhages and air in the cranial cavity and in the cerebral ventricals. Fr. Manuel Ponce gave him the last rites under the impression that Juan Jose would soon be dead. Fore the first few days Juan Jose was sedated. On the fifth, doctors found that his pupils were symmetrical and reactive and that he could move his arms and legs. On the sixth day he was released from the ICU to a regular ward. On the seventh day his feeding tube was removed. He was released on the tenth day after the fall. Subsequent tests by neurologists and other specialists showed a total recovery. Juan Jose subsequently gave up his drug habit and started school. It was determined that his change of condition came on 6 May at the very time John Paul II beatified Juan Diego. For a miracle of curing to be authenticated as such, the cure has to be sudden, complete and lasting. It has to be inexplicable by science. It has to be demonstrated that the venerable or blessed was invoked in a particular way. There are usually spiritual effects, such as conversion of life of the person cured and also witnesses. The decree concerning this miracle was promulgated on 20 December 2001. Holy Father Pope John Paul II canonized St. Juan Diego on 31 July 2002. Part of the Mass of Canonization of Juan Diego-7 Minutes Love the music.